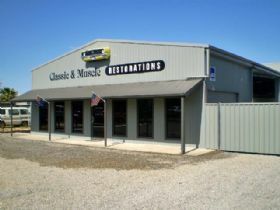 Welcome to Classic & Muscle Restorations. After outgrowing our previous workshop we relocated our business in January 2007 to its current location in Salisbury Plain, Adelaide SA with the vision of continuing to concentrate on building cars to a high standard for customers who own and have a passion for Australian and American muscle cars and classics. I have been heavily involved in the motor industry for twenty nine years. 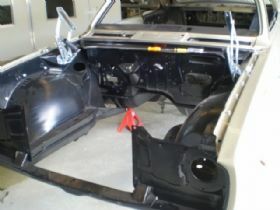 I am a qualified panel beater and spray painter and have owned and operated my own businesses since the late eighties. 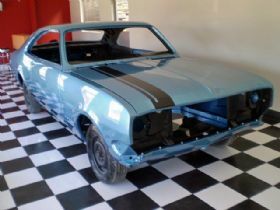 I have owned, driven and built many makes and models of muscle cars and classics since I was 15 years old. Our business now employs a team of five dedicated and experienced tradesmen; they have all been handpicked by me and pour their heart and soul into every project. 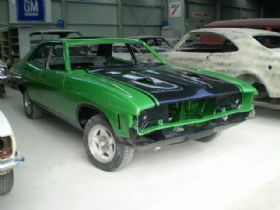 Our only focus is on producing quality restorations that are done right and will stand the test of time. Our benchmark is our attention to detail, research and accuracy in restoring cars to their original specs. We have many customers who book in their next car whilst taking delivery of the one we just finished for them. 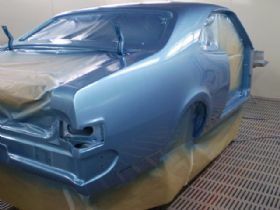 We provide a comprehensive range of services from a particular part of the job a customer cant do right through to drive in, drive out restorations taking care of body, paint, trim and drive train etc. We can coordinate and do the whole job from start to finish taking all the hassle out of it for our customers. We look at the car, advise the customer on how the job needs to be done correctly and work closely with them from drawing up a specification for their project to final delivery. From day one when the car arrives we photograph everything inside, outside, underneath and we also take photos of the disassembly and all the parts removed and stored. Everything we do from then on is recorded and we email these photos to the customer as work progresses. We can provide all images on a disk if required. We have a number of sources for hard to find parts and provide in house fabrication for light panels and rust repair sections. All the bodies are restored on our dedicated rotisserie allowing us access to repair every area of the body in high detail. We have just completed a large extension to the workshop which now provides enhanced clearance, light, ventilation, space and a new showroom. 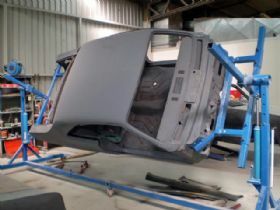 The workshop has a large reception area and can accommodate approximately 20 cars including our state of the art full gas fired downdraft computerised spray booth. Our customers come from all over Australia. We do as many cars from interstate as we do locally. Currently we have a range of Holden Monaros in the shop including five HK GTS two of which are 327 Bathurst cars, four HT GTS one being a GTS 350 and two HQ GTS Coupes. 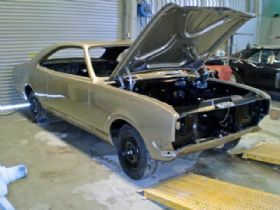 There is also a HD Holden X2 Premier, an LJ XU1 Torana, XW Ford GT and Pro street 68 SS Camaro. More cars are booked in which include Chargers , HX LE Monaro, HK 327 and an XB Ford GT sedan to name a few. We have experience with all American, Australian, GM, Ford and Chrysler models. We have also built a number of hot rods that have won awards across the country. We will take on any project providing we have the scope from the customer to complete the job to our high standard. 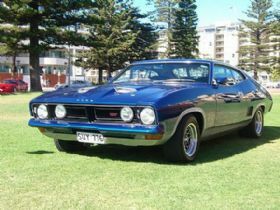 Recently completed cars include an XA GT sedan, XB GT coupe, Silver Mink HK Monaro, Blue metallic HK Monaro, 68 Camaro coupe, chopped 34 Chev hotrod (featured in August 08 Cruizin magazine) and many more. 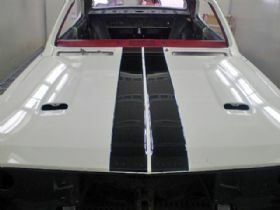 The majority of the restorations we carry out are to original equipment manufacturers specifications although we do build many modified cars for people who have that preference. 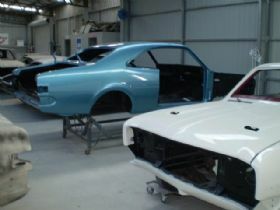 In order to provide top quality restorations we have a large range of equipment on site. This includes a pulling system, two rotisseries, baking oven, English wheel along with folders, rollers, guillotines, shrinkers and stretchers for metal fabrication work. We have spot, MIG and oxyacetylene welders. The staff themselves are car enthusiasts and share the customers passion for classics and muscle cars. Among the classics owned by the staff are four HK Monaros, a 68 Camaro RS convertible, HQ GTS coupe and a few Harleys. The business sponsors the local Monaro Club of South Australia and other local and interstate events. I am also a member of the GM Drivers Club of Australia. 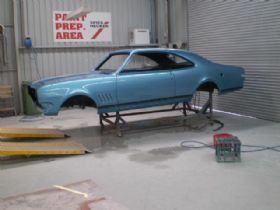 If you have an Australian or American muscle car or classic and are looking for a quality authentic restoration we can assist you. We grew up with these cars and have an intimate knowledge of them and combined with our time, experience in the industry, trust and communication, history and satisfied customers we know you will be very happy with the finished product. View and bookmark our website where you will find many pictures of recently completed cars and current projects. Our site is updated every few weeks. The workshop is open Monday to Friday from 8am 5pm and we are closed on public holidays. You are welcome to call, check out our website or drop by the workshop to see for yourself the level of care and attention we put into each project.